For whatever reason, I have this burning desire to take otherwise ‘normal’ recipes and turn them into spin-offs of my favourite desserts. You might call this weird, but I call it totally normal…as long as I don’t look over my Recipes page all at once and then I start to think an intervention might be necessary. My theory is that I am making up for lost time. After struggling with an eating disorder for 10 years, it is now time to have fun with food. Long gone are the days of eating the same 3 meals day in and day out and constantly feeling deprived. I like to have fun with food now, but at the same time, I want my food to work for me and leave me feeling my best. This burning desire to recreate desserts is especially strong at breakfast time; although I will be the first to admit that I don’t care for something too sweet in the morning. Carrot Cake Oatmeal and Pumpkin Pie Overnight Oats are on my regular breakfast rotation and I feel like I am beating the system getting to eat such delicious food first thing in the morning. And who doesn’t like to beat the system? Naturally, the next dessert on my breakfast hit list is Apple Pie Oatmeal. It took me a couple of trials, but I was blown away by the taste of my most recent attempt and I knew I had to share it with you on this blistery Winter morning. 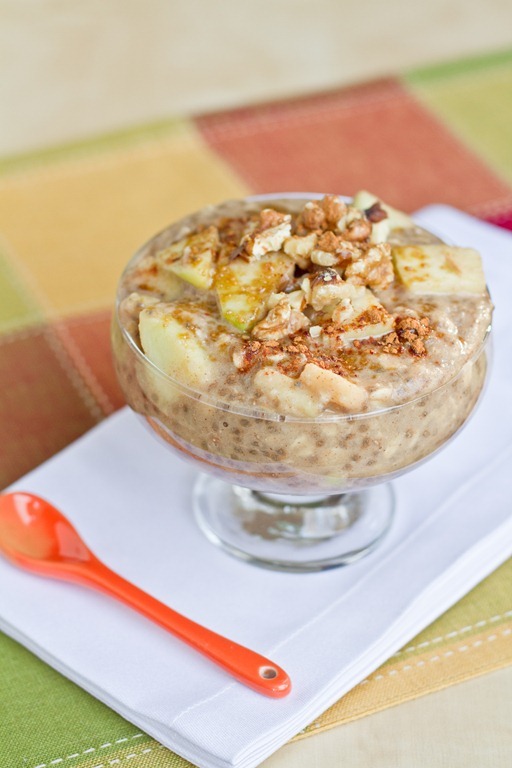 A warm embrace on a cold winter day, this Apple Pie Oatmeal will remind you of delicious apple pie, but will leave you feeling energized and ready to tackle the day ahead. The leftovers (if there are any!) taste amazing chilled, too. 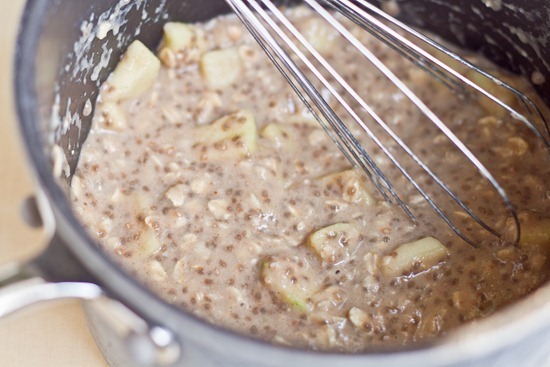 In a medium sized pot over medium heat, whisk together the oats, apple, chia seeds, cinnamon, ginger, salt, milk, maple syrup, and applesauce until combined. Cook over medium heat for about 9 to 15 minutes, stirring often. When the mixture thickens and the oats soften, it is ready. Stir in the pure vanilla extract and lemon juice (if using). Pour into a dish and serve with your desired toppings. This recipe really excites me because not only did I go crazy over the taste, but I love recipes that are based around simple, plant-based foods. They leave me feeling energized! 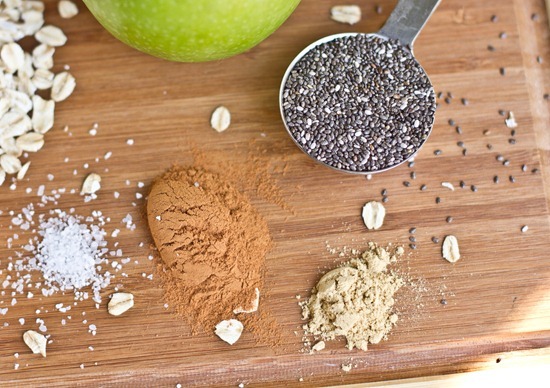 Add the oats, peeled and chopped apple, chia seeds, unsweetened applesauce, Almond milk, cinnamon, ginger, pinch of kosher salt into a pot and whisk well. Cook for about 8 minutes over medium heat. The applesauce, chia seeds, and chopped apple really bulk up this oatmeal! It turns into a huge bowl, which is always a good thing. Sprinkle with chopped walnuts, cinnamon, and a drizzle of maple syrup! and dig in to one of the most comforting bowls of oatmeal I have ever tried. It was quite delicious, but the recipe still needs some tweaking before I am ready to share it! I am really excited about this one though. You might want to check out my Carrot Cake Oatmeal too. 1. Check out my new Favourite Sweets list on the right hand sidebar…I will be updating it on a regular basis with my favourite sweet treats. Hey Angela! I absolutely love your blog! Can’t get enough! I was wondering if this fantastically delicious oatmeal does well refrigerated and reheated? Because I would LOVE to take this to work as a super yummy lunch! I’m not sure about it reheating, BUT I can say that I had some COLD straight out of the fridge and it was amazing! I make an oatmeal very similar to this every AM at work. 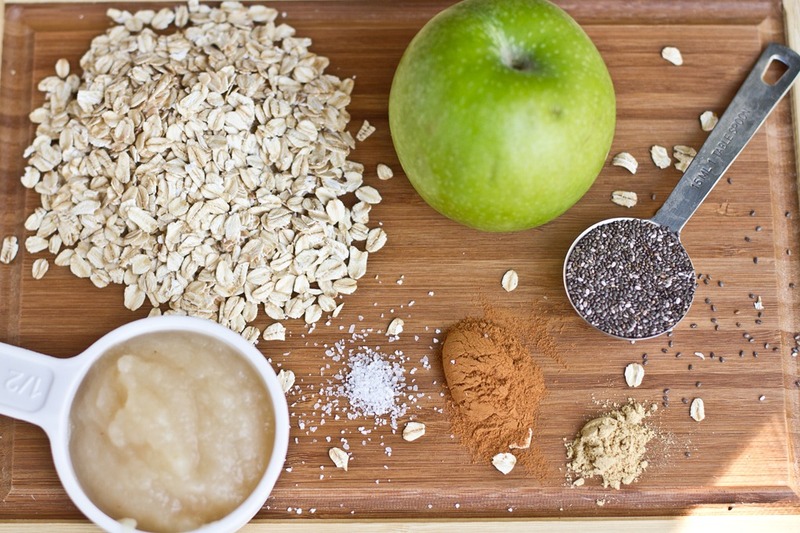 I just pre-package my oatmeal/cinnamon/flax(or chia seeds) with a little bit of sucanet in a bowl, bring a baggie of cut up apples, bring them to work and add the hot water to the bowl, then add in the apples. I find even with large flake oats (not instant) it will still cook with hot water in the bowl in a couple of minutes. I top mine with branbuds and almonds. YUMMY! I always make a big batch of oatmeal for the week.I reheat my serving of oatmeal by adding more almond milk. It’s perfect everytime. Just this morning as I stood in front of my pantry I realized that I am finally come into my own FUN FOOD era! Similar to you, disordered eating was a part of me for nearly 15 years. And yet here we are…finally concocting fabulous and energizing and nourishing things to put in our body! Well done today on this one! Today I was all about caramelized bananas in the oatmeal, akin to banana fosters. Oh yes it was incredible. I love apples in my oats. It seriously takes them to a whole other level. ANGELA, you amaze me with all that you have time to create. Another clearly delicious recipe!! When are ya going do the time organization post? Your prep shots are always so gorgeous! Yum. That’s so creative! 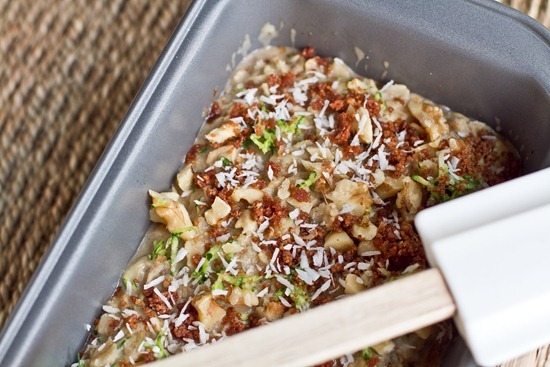 I would NEVER think to put zucchini in my oatmeal… I’m interested to see the final product! ahhhh your post send me straight into a sugar coma! awesome ;) ! Those are some great looking oats!!! You have the best ideas! Wow. Looks amazing! And I have apples and ginger on hand! Yesssss! I think this is such a cook idea to take sweet treats and turn them in to breakfast!! I’m really curious about the zuchinni bread oats, I would never have thought to do that. But it sound so perfect! I love eating cinnamon apple oatmeal in the morning. It’s so comforting. This looks so warm and comforting. I bet it would also be great with a few wheat berries- love those little guys. I love apples in oatmeal. Cinnamon apple oats are some of my favorite. I’ll have to try your version. Yummy! 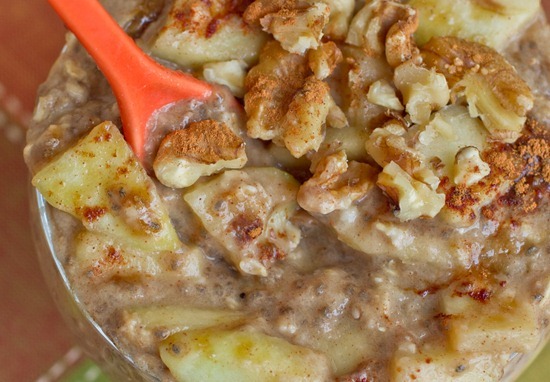 That apple-pie oatmeal is absolutely going to be my breakfast tomorrow morning. :) It sounds perfect for the coldest week so far this winter! i LOVE oatmeal and i LOVE apples. I love how chunky it is, my apple cinnamon oatmeal only has teeny-tiny pieces of apple. In my first version I chopped the apples really small, but I preferred the second version with BIG chunks! Really fun to eat. I LOVE how much fun you have with food! Nothing wrong with playing with your food if the result is that delicious! I love that bowl, too! You are an oatmeal genius! These look awesome! I am still enamored with the carrot cake oats – can’t wait to see what you come up with for zucchini oats. Just whipped this up – thanks for the inspiration! 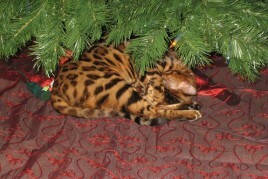 I know it’s early to call, but I think chia seeds are going to be my big find for 2011. I bought a package last week and I’ve been waxing poetic about them ever since. I’ve had so much fun going through your VOO recipes lately! they are so great aren’t they? I love that I can throw them in just about anything. This post made me smile- so glad you can enjoy food without restriction. Its such a freeing and beautiful feeling! This looks so good! I love putting steel cut oats in the crock pot overnight with spices,apples and raisins- the house smells amazing and I love the thickness of steel cut oats, plus the raisins get so plump :) Looking forward to zuc oats! Your bowl of oatmeal just made me hungry!!!!!!! definitely comfort in a bowl. WOW! I bet that tastes better than the real apple pie itself. I make a very similar version most mornings, too. Chopped apple, generous dashing of cinnamon, 1 Tbsp chia, 1/3 cup oats, 3/4 cup water and then I microwave it (oh the horror – I know!) on high for 1min45sec, stirring half way. I like to top mine with plain yogurt. 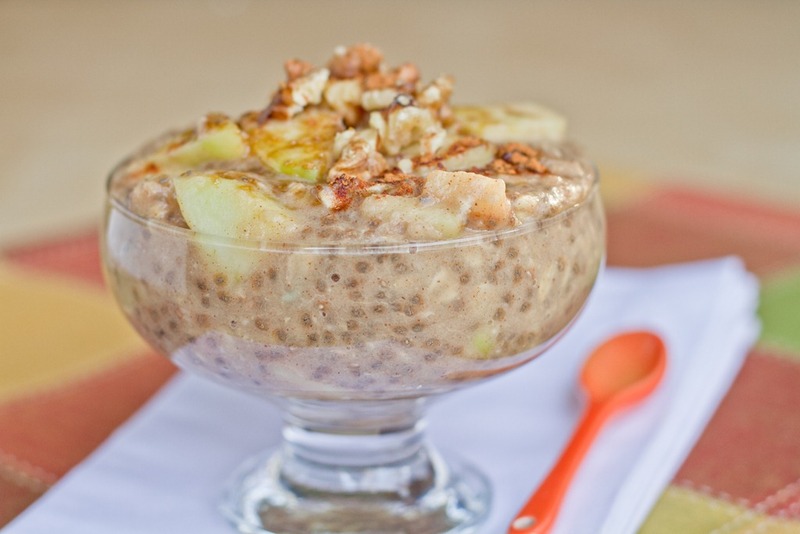 I find that it doesn’t need any sweetening, and the chia seeds make it very creamy so milk and applesauce are not necessary. Minimal ingredients and time, maximum deliciousness! 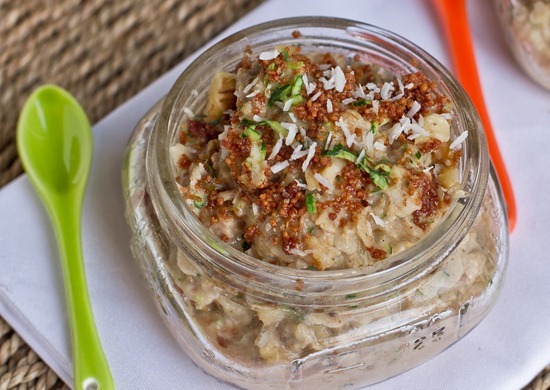 Can’t wait to see your zucchini bread oatmeal recipe – I love love love my oats! I’m all for pie in the morning! I love how you mix up oats so often. Definitely the best way to start the day! That looks absolutely incredible. Can’t wait to try it! 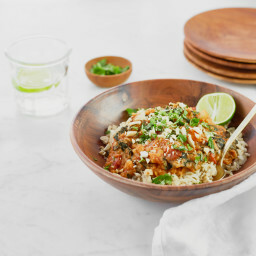 Oh man, you are killing me with these amazing and gorgeous recipes! we cook apples into our oatmeal almost all the time. good stuff! Man, your oatmeals are SO creative! I am going to have to actually try one out instead of just constantly drooling over them. Love that! Thanks for sharing :) Really cool how they did the video too. Mmmmm! My mouth is watering! I love your blog. LOVE IT. I have 3 recipes of yours I am going to make tonight :) Can’t wait. I want to try every recipe that you put on this one. I need my oatmeal to have a little something extra to make it more enjoyable. I can’t wait to see the zucchini bread recipe. I love the creative oatmeal ideas you share. It’s so easy to fall into an oatmeal rut, and you inspire me not to have the same mix ins all the time!!! Have a great day. Looks delish. I have oatmeal EVERY morning and I think chia seeds really add necessary volume. Keeps me full for hours! I eat this combo on a more than regular basis – I love the flavors together! I usually do a banana instead of the applesauce though – I might try the applesauce tomorrow! Well, diced apples are my favorite add-in with oatmeal, so I think that jazzing it up more to be apple pie oatmeal would be right up my alley. I also enjoy having fun with food. Healthy does not equal boring! I love me some apple pie oatmeal– made some the other day topped with almond butter :) To me, it’s better and WAY healthier than the real thing! Great view on having fun with food I can relate to, especially after years of fearing it. This oatmeal looks creative an wonderful and something I might try for dinner since my time is so limited on work mornings. Thanks! 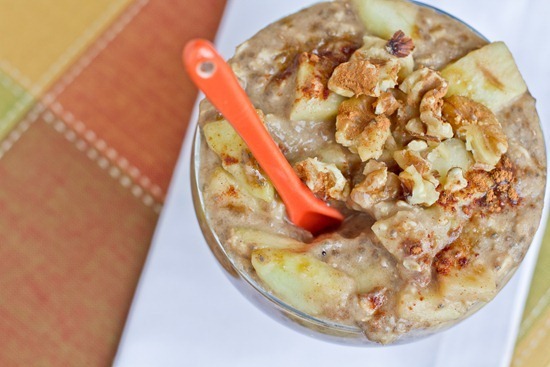 Oh the apple pie oatmeal looks delish! And so does the zuke bread spin off! YES!! I love your more elaborate recipes and photos; they are food as art. They inspire me. They make me want to be better and do better. They motivate me. But not every day is a day where I can be motivated to greatness :) Some days.. Most days…simple, easy, plant based is where it’s at. After all with a FT Job, FT Family to take care of….it’s the basics that get made and happen for me! I think it’s just fantastic that you encourage all of us to have FUN with our food. Life’s too short to get all wrapped up in it. But it’s a challenge that many of us are or have faced. It’s just so nice to see so many people that share the same outlook on food, no matter what their history is with it. 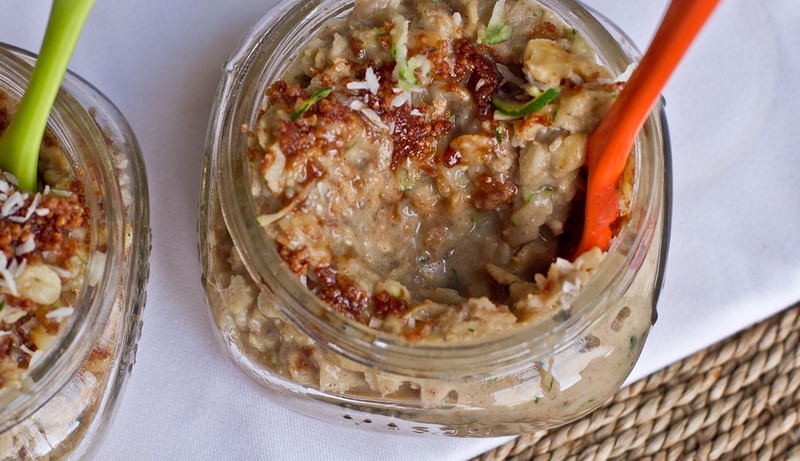 I’m really interested in this zucchini bread oatmeal! I went to the dentist this morning, and the hygienist was telling me that the garden she had growing up produced hundreds of zucchinis each year. Of course her mom didn’t want any zucchini to go to waste, so she put zucchini in EVERYTHING! The recipes she was listing off were unreal. haha I never thought zucchini could be enjoyed in so many ways. This looks aaaaamazing! I’d love to make it for dinner. Right not I’m into baked vanilla pear oats topped with blueberries+raspberries. with boost. haha. I absolutely love your take on dessert for breakfast! I made a delicious orange scented barley pudding for breakfast the the other day…! I can’t wait to see your zucchini oats! I make my own version of apple pie oats a lot and you’re right, it’s SO COMFORTING! Yummy! Did you know January is actually National Oatmeal Month. This is a great recipe to celebrate that! I think i’ll make something like this soon since I need to get back on track with eating some more oatmeal before winter is gone. I had something similar this morning and it was great! I love all your work on your blog. Love your blog! I was wondering what type of running shoes you use or have used and like, I’m looking for a good, not too expensive, brand? Oh my – this is BRILLIANT! Thank you for the amazing inspiration and recipes. I have been making the carrot cake oatmeal at least once a week, and it is great. I have to try this one sometime this week. Yum! Apple pie oatmeal sound delicious! I told my husband that you posted this recipe and we are both excited to try it. We LOVE your carrot cake oatmeal! I absolutely love oatmeal creativity! My favorite is oatmeal with peanut butter and chocolate chips. Sooo decadent! I don’t really like apples in oatmeal, but my husband just picked up a packet of chai oats with apple and now I must try it. I admire how open you are about your previous eating disorder. Do you mind if I ask how you feel or your family feels about you being so open with it on such a, well, grand scale?! :) And also do you find that blogging or being around food all the time makes it more of an obsession or “fine line”? I love all the new updates and changes to your blog..beautiful :) I am an apple pie freak, so this sounds heavently! Looks amazing! 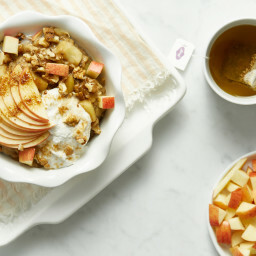 I bet this would work great with quinoa :) I love apple pie anything, we made a apple pie parfait over the holidays, but now I want to make this!!! I have added apples to my oatmeal, but it never looks aas good as yours. I’ll have to follow your recipe to a t. Your desserts always look so good and I love that you use natural whole foods ingredients. I’ve recently developed an oatmeal obsession – I love the way you plated this! I want this, all the time! I make something similar to this in the AM, but w/out chia seeds…i’ll have to add that into the mix next time. I used to LOVE apple pie as a kid. Now that I have celiac, I will not be eating the real thing anytime soon– but THIS looks like a perfect substitute. Thanks! 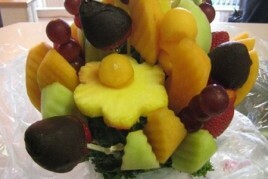 Looks yummy Angela.. this may just make an appearance this week at my breakfast table. Sounds like an awesome delicious oatmeal. I’ve made the apple oatmeal from the book “French Women don’t get Fat” several times and that was great so I’m sure this is too! Is that a good cookbook? Its more of a book about eating well, eating healthy, and enjoying your food. There are also a bunch of great recipes in it. Its a great book and I highly suggest it if your interested. I am going to bed right now so that breakfast arrives “sooner.” Cannot WAIT to try this!! Mmmmmmm. I was going to have a giant green monster for breakfast tomorrow, but now I might have this instead! Oh my, that looks delicious. 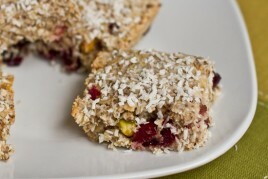 I might have to make this tomorrow morning :) Thanks for the recipe!! Love your blog! Looks lovely! 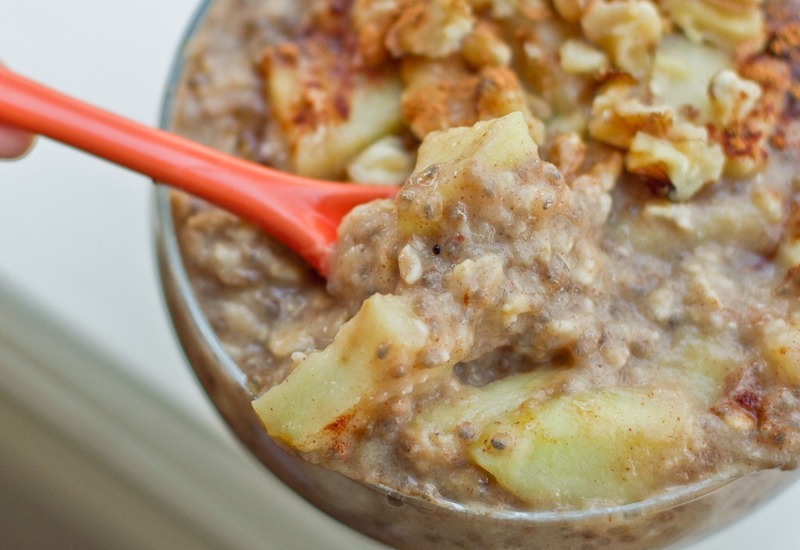 The apple pie oatmeal looks like it would actually taste remarkably like apple pie. Respect. The carrot cake oatmeal looks AMAZING! I’ve been craving carrots lately like crazy, I may try this for breakfast tomorrow! I love breakfasts that taste like dessert! 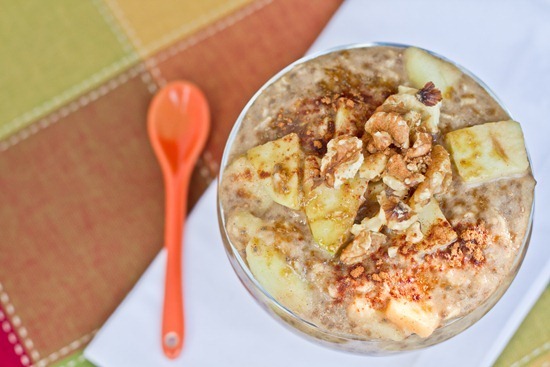 This apple pie oatmeal sounds sooo yummy! I don’t have any apples in the house, so I’m going to make carrot cake oatmeal right now instead! Oh man, oh man, Apple Pie Oats!!!! Ohmygosh!!! I CAN’T WAIT TO MAKE THIS!!!! You know, as silly as it sounds, I haven’t had an apple in weeks — I’ve totally switched to eating clementines (and my usual banana per day). I need more apples in my life! I have made 3 of your recipes in the past 1 1/2 wks. The pumpkin pie cinnamon rolls were sooo delish! i devoured one right out of the oven, made the curried lentils last night, and had pumpkin pie oatmeal this morning! Thank you for posting such great recipes and having such a strong, positive spirit—it makes my day sometimes! Yum! Both of those combos look delicious. Can’t wait for the zucchini recipe! Hi Angela! I love your blog and recipes! I am not a vegan, but i found your blog because i am looking for new creative ways to add more vegetables and fruit to my diet. 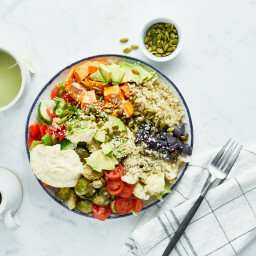 What i really love about your site, is you take most of my favoite recipes and offer a healthy alternative that tastes so great i don’t feel like i miss the old recipe at all! I have a silly question, where do you get your cute colored spoons that i see in the oatmeal photos? Also where can i get a big fat plastic straw for my green smoothies? One more thing, i love how you use mason jars for storing things. It is economical, eco-friendly, and my favoite is that it reminds me of how my grandma did the same thing! I am thankful to have found your lovely site, i look forward to your post each day! Take good care! i read this post before breakfast and just had to make it! ‘cept i didn’t have apples, just bananas…and i hate maple syrup…but i just used banana and a few drops of liquid stevia and holy moly the deliciousness! i had my doubts before i added the vanilla extract, thinking “damn, i really don’t want to cook another bowl of oatmeal but i just don’t like this.” but then i added the vanilla and the deliciousness came together into a bowl of magic breakfast…i’ll never doubt again! thanks for the yummy breakfast. Hmm. I made this twice! I didn’t think I would like creamy oatmeal. I like it thick and moist Apple Pie oatmeal was one of my favourite creations to make. The first time I actually mis-read the recipe and added 1.50 cups of Almond Milk instead of 1.25 – which made it too creamy (and I used a pink Gala apple which wasn’t too bad but it wasn’t omg-wow fantastic). It was much better the day after (and actually i kept tasting it cold, and it was YUM). I made it again today – WITH the right amount of milk, Granny Smith Apples and I see the love. I see myself making this a lot. [and once I get an oven – ditto on the carrot cake oatmeal). 1 key note: I used my own applesauce. I don’t buy storebought. I used strawberry applesauce (as that’s the flavour of the week) and it gave it a nice pink sheen. Thanks for sharing! Good to know. :) I was wondering if another kind of apple would work. Interesting to play around with. :) Enjoy! You really should consider publishing a cook book. I would buy it in a heartbeat. Wow! I could have written this myself! Angela, I’m a long-time lurker/very new blogger and I think you’re just wonderful. Thank you for being such an inspiration. Love love the recipes but mostly the photos of your creations. So clean and clear and your serving dishes are most appropriate and a must use for me. I never liked oatmeal due to the texture of it, but now I can’t live without it! Mahalo! I must be the first guy to make this. It was very yummy! hah well I’m happy you commented!! Glad you enjoyed it Cody. This was DELICIOUS! I doubled the recipe and between myself and my three girls (ages 5, 3, and 1), it was licked clean! Thanks for yummy healthy breakfast recipe! Hey thanks for this! 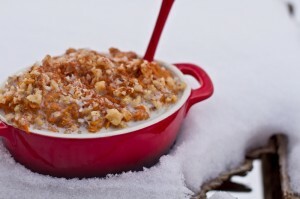 I am altering your Apple Pie Oatmeal recipe (just the procedure) to take it camping. Just whipped this up for breakfast this cold morning and it was fabulous! Loved how big a portion it ended up being. Thanks for a great recipe. Looking forward to trying more recipes! Thanks for the delicious breakfast! Here’s how mine turned out: http://pinterest.com/pin/78813062201217671/. Yum! Hi Angela ! I’m not especially familiar with vegan ingredients, so what are chia seeds exactly and what are their benefits ? why use this instead of another ingredient like flax for example. thank you !!! 6x the calcium in milk! You have a fabulous site. Good on you. I was looking at the comments for keeping oatmeal. 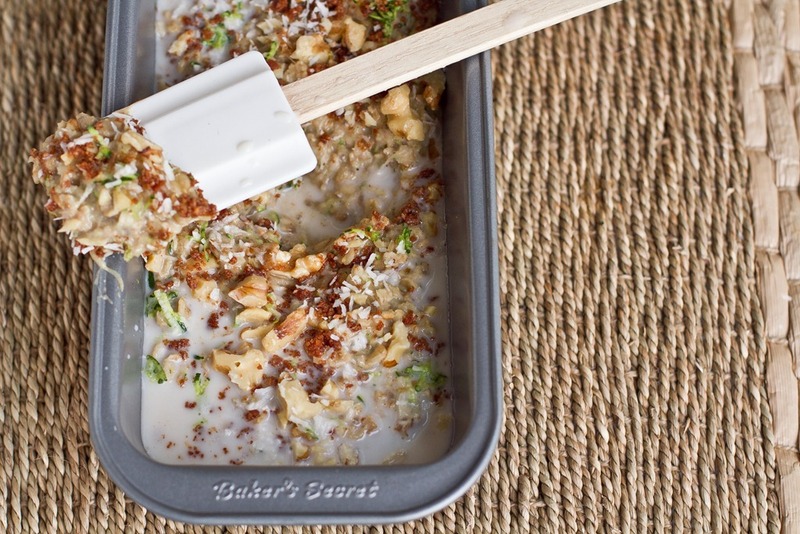 I have a recipe where you cook the oatmeal and then place it in a baking dish and let it cool. Once chilled, you can slice into squares or wedges. Top with dried fruit compotes, apple pie mixture above … whatever. My recipe fries the oatmeal wedges to reheat, but a microwave will do. Good for those who only want to cook oats once a week. I actually made this very recipe this morning for breakfast and I must say it is my favorite so far! I’m excited to try some of the other things you’ve put up, but this is a must try for those who haven’t done so yet! What a perfect time of the year to try an outstanding bowl of oatmeal, especially for someone that thought she hated oatmeal (like you did in the past). This was super amazing. I think the chia seeds are responsible for turning a regular meh oatmeal into a delicious custard. I could eat this every morning! I used a Gala apple and since I didn’t have applesauce on hand I decided to replace it with an extremely ripe banana. You have converted me. Thank you for an awesome recipe!!! I loved this recipe, thank you so much, I finally like eating oats! I used crushed oats because these were the only ones I had in the house, and made apple sauce from scratch, cooking a chopped up apple with some water before I started the original recipe. It was a lovely dessert in winter Holland. When you use oats, are you using the usual Quaker oats or a different type? Yes Quaker rolled oats will work :) Anything that says rolled oats or regular oats usually mean the same thing! Hope this helps. We just got 10 inches of snow dumped on us last night (the weather people were a little off on their three inch estimate). I’ve been waiting to try this oatmeal and today was the perfect day. I love this oatmeal. Even the bites with no apple taste delicious. Will definitely be making this again! Thanks for sharing! Fantastic recipe. I made it this morning. My home smells like a pie factory:) It was so yummy!! Thanks!! I doubled this recipe today and I know I followed the directions properly but it was way too runny. I added another handful of oats and it was perfect. I wonder if this recipe just doesn’t work if you double it? I would love to see one of an actual apple pie too. I’m sure that this oatmeal version is probably healthier but it would be great to see your versions of more common desserts as well. Could I make this with Steel Cut Oats instead of oatmeal? I just made this and added a giant blob of peanut butter on top, and and oh my gosh can I say heaven in a bowl? I’ve been recovering from restrictive eating myself, and love finding nourishing yet beautiful recipes thank you! Glad you enjoyed it, Maria! I’ve been making this recipe for a while and I love it! I’ve modified it a bit to fit my own taste and what ingredients I usually have (wheat germ instead of chia seeds etc.) and it always comes out great. I’ve actually been experimenting with adding a little bit of curry powder to it, and I love how it turns out. Just 1/8 tsp. of curry powder for a tiny bit of warmth. Curry powder sounds like such a great twist, Jonathan! Now I’m curious – I’ll have to test that out sometime, for sure. Oh wow, this was awesome!! I used a honey crisp and holy! There was SO much I was full for HOURS. Honestly I didn’t even want lunch until 3 pm. And it was super delicious! Perfect fall breakfast! I made this for breakfast today, my first time adding chia seeds to oatmeal. It was delicious! I omitted the maple syrup as I’m trying to avoid added sugar, and also did not add applesauce, just a big chopped up apple. Very yummy, thanks for the recipe! What apple sauce did you use? Unsure where to get this! Hey Freyja, you can make your own if you don’t have access to store-bought applesauce. I usually buy whatever my grocery store (I like organic and in glass jars) has and keep it stocked in my pantry. 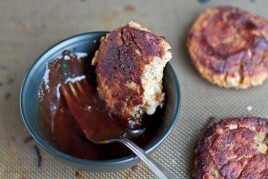 Next post: Vegan Dinner Party in Florida!